More than 100 farmers have reportedly committed suicide in Uttar Pradesh, one of the most impoverished states in India, because of a hailstorm that destroyed their crops. The situation will only worsen with 50 of 75 districts being hit by a severe drought. Despite having evidence of the drought, the provincial government took two and a half months to declare it. They announced it step by step, a few districts at a time, with the final declaration coming as late as 19 November, 2015-the Rabi season having already set in! Unfortunately, Uttar Pradesh is not the only province awaiting a drought declaration. The practice is routine for most states, Telangana being a similar case this year. Uttar Pradesh administration was well aware of the drought-like conditions prevailing in the state by the first week of September. 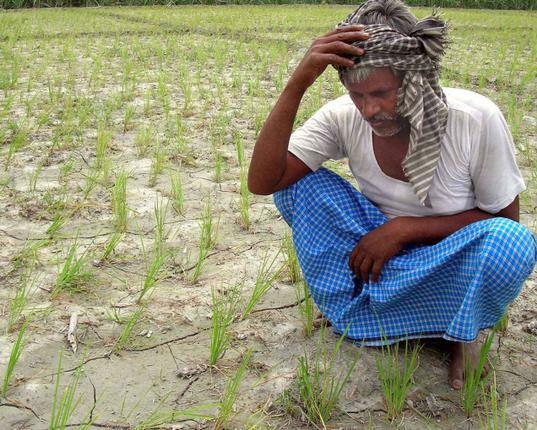 It had admitted that the deficit rainfall in the Kharif season had reached a disastrous 55% in western Uttar Pradesh and was highest in all meteorological sub-divisions in the country. Rainfall deficit for eastern Uttar Pradesh was topped to reach as high as 43 percent. Anyone, with even a cursory knowledge of agriculture, would know that such a heavy rainfall deficit well into the Kharif season would make crop survival very precarious. Common knowledge would know the effects it would have on farmers already caught in a web of suicides induced by agrarian distress. But then, the government of Uttar Pradesh is not just anyone. It sat on all the data and waited until November to declare a drought. Their declaration put all revenue collections from farmers on hold and brought in a host of relief measures… at least in theory. Delay in declaring a drought denies farmers of temporary relief measures, despite the fact that they are often the only life lines available to small and marginal farmers. Revenue collection, for instance, keeps popping up in farm suicide data reports. Failure to pay their dues and the resultant harassment from revenue officials causes a loss of honour. At times it becomes a strong enough reason to force farmers to take their own lives in a society deeply rooted in patriarchal codes of honour. Other drought-relief measures include: state supported contingency crop planning, relief employment providing a source of livelihood, aid in setting up tube wells or other sources of irrigation and providing food as well as cattle fodder. All of this, however, would only start after an official declaration of drought. With negligible insurance coverage for farmers in India, some studies put Uttar Pradesh at the bottom of the list with merely 3.5 percent of farmers with crop insurance. Crop failure often means the beginning of the end for affected families. Add to this the absurd eye estimation of a revenue clerk looking at a crop while calculating the losses’ practice employed for deciding compensation for loss. It seems the picture cannot get grimmer. But it can. It is a fact that under the National Diaster Relief Fund norms, the maximum cash relief a farmer can get is Rs 2,750 per acre in rain fed areas and Rs 5,465 per acre in assured irrigation areas. The cash relief is then capped at Rs 13,475 and Rs 26,778 for rain fed and irrigated areas respectively. A cruel joke indeed. This is the situation on the ground, in the face of the need of building a real time response system for dealing with the agrarian crisis. Real time responses, however, need to acknowledge the crisis in real time. A drought, that would destroy lives, cannot wait for ‘official recognition’.